This morning we had a chat about writing which overcame geographical and a few other barriers. This webinar was an innovation set up by Branch Support Librarian Phong Truong after attending a talk I’d given at the SLV on our YA novel ‘f2m:the boy within’. She wanted to use technology to attract youth & provide access to counselling resources on issues such as gender. Across the Tasman and across Skype, it was a 3 way Webinar between Wellington Shire Gippsland Youth Council members, co-author Ryan Kennedy in Wellington New Zealand and myself in Melbourne. Ironically, at first, we didn’t realise both places were both called Wellington. Did it work? Yes. But we had a few technical hitches. Despite the trial on Thursday afternoon, where audio problems were solved with a closer microphone relaying questions, getting the visuals working three ways on the Saturday ‘real’ event was a challenge. Role modelling by Ryan as young novelist, writing first book from own gender experience. Demonstration of how ‘outside’ authors could be accessed, where-ever they or potential readers live. Practical sharing of how co-authors had utilised electronic ways of collaborating (and how to cope when things go wrong). Good questions and candid answers. Encourageded rural youth to utilise Internet resources when seeking answers to problems: relationships, gender or literary. This area has a Youth Council with a Youth Mayor, and Pauline the Deputy Youth Mayor participated. Network connection recommended over Wifi. Need to have a test session, especially for sound. Re-position seating. Suggest audience identify themselves when asking questions. Wear a bright coloured jacket to stand out from dark chairs. Intimate group enabled questions to be answered fully. ‘Casual feel’ atmosphere conducive to a real exchange. Since our YA novel subject matter of gender was controversial, helpful to have co-authors viewpoints from varied backgrounds & generations & access to their website resources such as YA guests blogs. Needs a co-ordinator to arrange books available for reading beforehand & this is where e-books are more easily accessible. Several youth who were expected didn’t make it, but there were eight in the room, including the deputy Youth Mayor. Technical issues with getting the visuals to work three ways on Skype. After a 10 minute delay, we decided to go with visuals between the Wellington Youth and Ryan in NZ, and utilise Hazel’s audio although they could ‘see’ Hazel. At the end, we had a concentrated visual session between Hazel and the group in Gippsland. Co-ordinating: Phong prepared books, handouts etc and invited reps from youth groupings, but 10 am Saturday a bad time for techie support and those who play football. Questions covered writing issues such as how to co-write on Skype and e-mail, how did the book get published and benefits in e-book format. 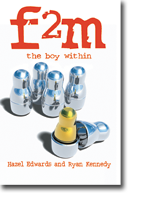 Gender questions included issues such as how do you get support in a rural area, Ryan’s personal experiences transitioning and media and librarian reactions to ‘f2m:the boy within’. PS Only afterwards, I realised the room in which participants chatted was called the Wellington Room! I was still in my Melbourne study, but my husband had cleared up his desk, visible behind my head on the web cam. That’s another plus for participating in web chats! Desks get tidied or are caught forever on web cam. The Wellington Shire Youth Council is made up of 18 youth between the ages of 12-25, who eagerly represent young people within Wellington Shire. It provides an avenue for youth issues, feedback and communications to liaise with Wellington Shire Council, forming a bridge between youth and local government. Youth Councillors are instigators of positive change and act as role models and leaders with the community. Thankyou to Hazel and Phong for sharing their webchat experience. What I love about this webchat is that regional youth were provided with role-modeling from the authors, experienced amazing technology, and discovered how there are really no barriers anymore to what can be achieved (co-authors Hazel and Ryan explained how they co-wrote on Skype). If you are thinking of organising your own author/youth chat via Skype and would like to contact Hazel, Ryan, or Phong, please leave a comment or contact them via their websites (linked to above). 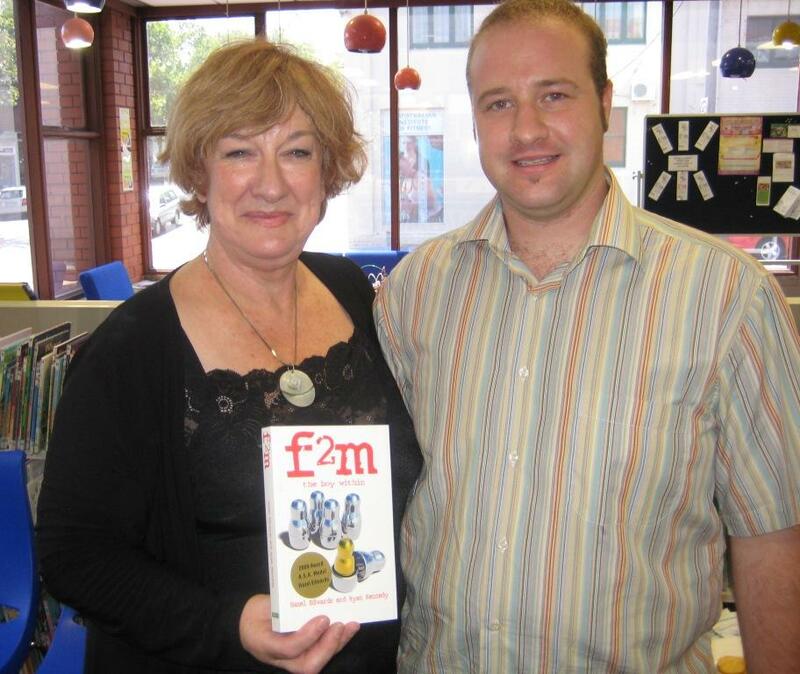 To see reviews of the fabulous book f2m, visit Google Reads. The internet has truly opened the world up to easier communication and hopefully to more open communication. Hazel is a terrific ambassador for utilizing new technology and mentoring young people to express who they truly are. Sounds like it was a fun morning was had via Skype!